Palestinian Prime Minister Ismail Haniyeh vowed on Friday that his Hamas-led government will never recognize Israel and will continue to fight for the liberation of Jerusalem. "The world arrogance (US) and Zionists... want us to recognize the usurpation of the Palestinian lands and stop jihad and resistance and accept the agreements reached with the Zionist enemies in the past," Haniyeh told thousands of Friday prayer worshippers in a speech at Tehran University. The United States is pressing the Hamas-led Palestinian government to recognize Israel, renounce violence and form a national unity government with the moderate Fatah party in a bid to revive the peace process with Israel. "I'm insisting from this podium that these issues won't materialize. We will never recognize the usurper Zionist government and will continue our jihad-like movement until the liberation of Jerusalem," he said. Haniyeh arrived in the Iranian capital on Thursday for a four-day visit for talks with Iranian leaders including hardline President Mahmoud Ahmadinejad who has called for Israel to be "wiped off the map." The Palestinian prime minister is on his first tour abroad since his Hamas-led government took office in March. Haniyeh called Iran, a longtime ally of Hamas, the Palestinians' "strategic depth" because they were together in their fight against Israel. "They (Israelis) assume the Palestinian nation is alone. This is an illusion. ... We have a strategic depth in the Islamic Republic of Iran. This country (Iran) is our powerful, dynamic and stable depth," he said. Iran has provided the Hamas-led Palestinian government with USD 120 million this year despite a US-led international financial boycott of the Palestinian government. The financial aid has boosted Iran's influence among Palestinians. Along with his meeting with Ahmadinejad, Haniyeh is scheduled to hold talks with Supreme Leader Ayatollah Ali Khamenei and former president Hashemi Rafsanjani during his visit. 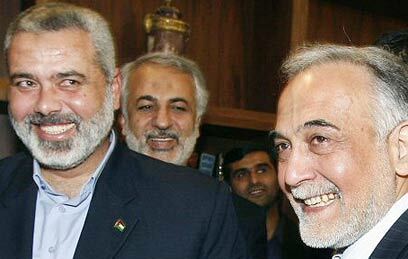 See all talkbacks "Haniyeh vows to never recognize Israel "